At Natural Dentist Associates in Rockville MD, we use Porcelain Veneers in many Cosmetic Dentistry Cases. Porcelain Veneers are thin shells of medical- grade porcelain that cover a tooth’s surface. Porcelain Veneers can be the most effective way to improve the appearance of a person’s smile. Porcelain Veneers appear just like a set of natural, perfect teeth. For a Complimentary Cosmetic Dentistry Consultation contact us today at 301-770-2270. IV Sedation Dentistry is available for this procedure in Rockville, Maryland. conservative because the veneer refaces the front of the tooth and does not require altering the back surfaces of you teeth. Are Porcelain Veneers the only way to go, if I want to improve the appearance of my smile? In many cases, there are other options. Typically, the first solutions a Cosmetic Dentist will turn to are tooth whitening, along with Invisalign and/or reshaping. In the cases where such methods have not been or will not be effective, Porcelain Crowns or Porcelain Veneers are generally the next step for a Cosmetic Dentist and patient to explore. What’s the procedure involved in getting Porcelain Veneers? During a different visit, we’ll remove a small layer—0.5 mm, to be precise—of your tooth’s outer layer. 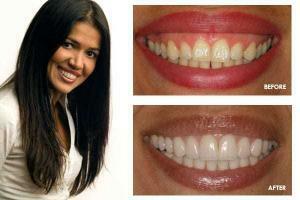 We’ll cover the teeth that are being treated with temporary Composite Veneers. Your permanent Porcelain Veneers are custom made in a lab, and that process takes about a week. After we put your permanent Veneers in, we’ll ask you to come in for a visit again afterwards so that we can check to make sure your bite is still correct. Sometimes, a minor adjustment or two is needed. Will I still get cavities? Patients with Veneers still get cavities at the same average rate as other patients. Will my teeth be more sensitive afterwards? At the end of the process, no. It is possible that your teeth will be slightly more sensitive for a few days after the temporary veneers are put in. Can Porcelain Veneers get stained? The Veneers themselves cannot be stained. Is this a permanent fix for my smile? Veneers are a long-lasting fix. We expect our Porcelain Veneers to last at least 10 years or longer, on the average. Some of our newer ones may last a lifetime. It’s worth noting, however, that the lifespan of a Porcelain Veneer depends on a person’s habits. Veneers will last longer in the mouth of a person who wears a protective mouthguard or Nightguard while they sleep, or who doesn’t clench in their teeth, for example.